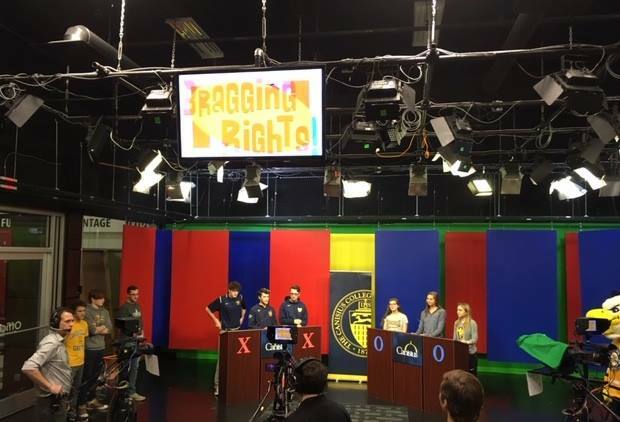 Students in Dr. Barbara Irwin’s “Broadcasting in America” class produced four episodes of WBBZ-TV’s Bragging Rights, which pits two teams of three against one another in a race to answer trivia questions on a variety of subjects. “I like to have my students work on real-world projects, so this was an opportunity for them to actually be an integral part of broadcasting, producing a program start to finish,” said Dr. Irwin, Professor of Communication Studies. Dr. Irwin reached out to various contacts at local television stations to determine if there was any interest in the project. After a brief conversation with WBBZ-TV’s John Di Sciullo, it was determined that the students would produce episodes of Bragging Rights, a local trivia gameshow. Dr. Irwin reached out to various contacts at local television and radio stations to determine if there was any interest in those stations developing a project with her students. After a brief conversation with WBBZ-TV’s John Di Sciullo, it was determined that the students would produce episodes of Bragging Rights, a local trivia gameshow. “I was familiar with the show and I knew John would be a great person to work with” said Dr. Irwin. Other projects in the class included students producing a 30-minute Edge Session with a local band for WEDG 103.3-FM The Edge and a newscast for WGRZ-TV. All of the projects provided the students with direct, hands-on experience in broadcasting. “I was really proud of the students in my class. These projects were all challenging and they stepped up and did a wonderful job. I hope they learned a lot about broadcasting,” said Dr. Irwin.